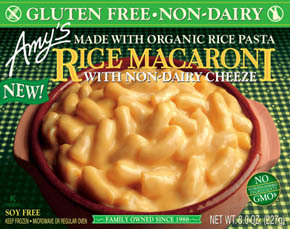 I just tried Amy’s Kitchen Dairy Free Rice Macaroni & Cheeze for the first time and have to give a two thumbs up! They have managed to find a non-dairy and non-soy cheddar flavored cheese that tastes pretty much like the real thing. I have been jonessing for mac ‘n cheese, but couldn’t find anything that was dairy-free that tasted good. I found that I hated soy-based cheese substitutes because they often tasted like plastic. William found a box mix, but I’m not a fan of the regular mac ‘n cheese box mix, let allow a substitute. I wanted something that tasted like home-made or from a good restaurant. I’m happy to say that Amy’s really fits the bill. It was gooey like real cheese and tasted just like real cheddar. I’m not sure how they did it, but if I had to do a taste test between this product and one that used real cheddar, I don’t think I could tell the difference. An added bonus is that it’s also gluten-free, which means William can also eat it. Now I know why this tastes so good…they use Daiya cheese, which, in my opinion, is the only vegan cheese that doesn’t taste like plastic!